Objectively speaking, these disagreements on style reflect a less-than-rigorous definition of which type of Mandarin each party is referring to. Because there has been a failure by all concerned to define fully the linguistic and socio-linguistic parameters of their assumed language(s), Mandarin oranges are often unwittingly being compared with Mandarin apples. This paper is a preliminary attempt to articulate the fundamental differences distinguishing four major language types subsumed under the single English heading ‘Mandarin’. Though the Chinese terms putonghua/guoyu, guanhua and difanghua help to accentuate the conceptual distinctions distinguishing our four types of Mandarin, it is arguable that even Chinese scholars are not immune from confusing one language with another. One of the hallmarks of twentieth century linguistic science is the principle that a full linguistic grammar must contain not just the sounds of the language, or just its vocabulary, or just its sentence patterns, but rather information about all three, as well as, depending on the specific philosophical orientation of the linguist, a set of rules which transforms its phonology into its lexicon and its lexicon into acceptable sentences. In addition, socio-linguists have sensitized us to the need to put language in a social context, giving us concepts such as speech communities and language variation. Applying these ideas to the English term “Mandarin”, it is possible to identify four distinct language types, one of which can be further sub-divided into a myriad of unique examples. The first type of “Mandarin” to be recognized is what is called putonghua – – on the Chinese mainland, guoyu in Taiwan, and huayu in Singapore. Outside of China this (so-called) standard, official Mandarin corresponds to the language found in textbooks. What characterizes this language is grammatical underspecification, a lack of any native speakers and very few truly fluent speakers. By grammatical underspecification I mean that little if any information is given by presumably competent authorities about what words to use and what sentence patterns are correct. As to this first feature, one need only look to the official definitions used in Taiwan and on the mainland to confirm just how underspecified the grammar of Idealized Mandarin really is. In Taiwan, guoyu must include the ordinary oral language and the ordinary words found on the written page. Both of these are consistent in having a standard pronunciation, a standard lexicon, and a standard syntax. What is the standard for guoyu? This definition, though paying lip service to the need for addressing guoyu’s lexicon and syntax, fails miserably in this regard. Lacking the specifics for what words should be used and how this language-by-committee should go about putting them together to form sentences, it is not surprising that Chinese in Taiwan and on the mainland, when attempting to speak this abstract entity, appeal heavily to the lexicon and sentence patterns found within the natural languages spoken in the irrespective localities. Thus, what passes for spoken guoyu/putonghua in China varies greatly from site to site. Interestingly, it is only the Chinese language student overseas who does not have to contend with an underspecified grammar, since textbooks provide him with both a lexical inventory and a list of acceptable sentence patterns. Because a student’s knowledge of Chinese is limited solely to what he finds in the textbook, he necessarily speaks a language very different from that found anywhere in China. Thus the only fluent speakers of this idealized language are experienced language teachers outside of China, who after many years of tailoring their speech to the knowledge of their students, have become most proficient in it. Another trait of Idealized Mandarin is its appeal to the written language rather than the spoken form as the ultimate arbiter of grammar. It is a common practice among linguists in china to base their research not so much on the languages they hear spoken around them, but rather on a corpus of written material gleaned from one or more modern novels. The working assumption seems to be that if material is in a published form, then it is likely to be linguistically “correct.” However, if a word or pattern is merely spoken then, regardless of how frequently it is used, there is no a priori reason for concluding that it is guoyu/putonghua. One reason why linguists dealing with Idealized Mandarin have traditionally emphasized the written language over the spoken likely relates to its historical background. As Barnes (1982) notes, the original purpose of guoyu was simply to codify a standardized pronunciation for use in reading aloud the written language, and in the process bring this static form to life. In other words, the written language was taken as basic, and the spoken language was intended to follow suit. This faith in the primacy of the written word has caused many people to believe that it possesses a magical unifying power. They take it for granted that most everything found upon the written page is to be found in equal proportions in all varieties of speech in all regions of Han-speaking China, and as such ignore important considerations about speech communities, speech repertoires and frequencies of usage. The second type of language referred to by the term ‘Mandarin’ is the language spoken by the scholar-official class in imperial China. As with the language described above, it lacked both a fully codified grammar and any identifiable native speakers. Likewise, it is doubtful that it had many fluent speakers. 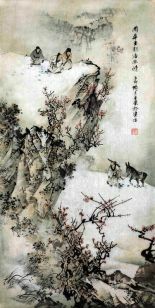 What distinguishes Imperial from Idealized Mandarin is the former language’s total silence about the existence of a vocabulary or a syntax, as well as the imprecise, pre-modern methods available to linguists of that period for indicating pronunciation. 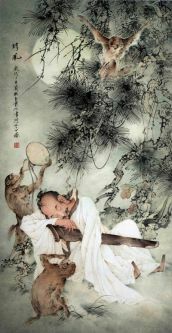 Furthermore, as early twentieth- century intransigence on the part of educated Chinese to accept northern pronunciation as the national standard indicates, the prestige of rhyme books among the scholarly class was very great. It is unlikely that they were willing to turn their backs on this phonological system in favor of something which differed significantly from their poetic tradition. Since Imperial Mandarin pronunciation could only be indicated clumsily at best , and since no attention was paid to vocabulary and syntax, we can speculate that prior to this century there was greater variance in the style of Imperial Mandarin from region to region than one finds today among the varieties of Local Mandarin (see discussion below). Chinese linguists such as Wang Li and Ting Pang-hsin (both in personal communications with the author) have argued that the major distinction among Chinese dialects is phonological in nature, that very few differences can be found in their lexical and syntactic qualities. Such conclusions are acceptable only with the qualification that because phonological differences among dialects are often the more salient, and because China has a long tradition of meticulous phonological scholarship, modern dialect documentation and classification has also naturally been oriented in this direction. It is only because of this phonological bias that dialects appear to differ from one another primarily on the basis of pronunciation. It is dangerously misleading to assume that lexical and syntactic considerations are inconsequential, since works such as Hanyu Fangyan Cihui (1964), Hashimoto (1986), Zhu (1984) and R. Cheng (1985) attest to striking lexical and syntactic differences over geographical space. Another misleading aspect of Geographical Mandarin is the suggestion that because there exists a set of linguistic diagnostics common to a large geographical region, there ought to be a high degree of mutual intelligibility among the languages distributed within that region. Certainly the degree of mutual intelligibility within Geographical Mandarin is remarkably high in light of the linguistic situation outside of Mandarin-speaking areas. However, one must not forget that this so-called high degree of mutual intelligibility is only relative. If one were to take monolingual speakers from the various speech communities contained within this linguistic region and bring them face-to-face, we would find the degree of functional intelligibility would be quite low. It would seem then that Geographical Mandarin, along with Idealized Mandarin and Imperial Mandarin, is an intangible entity. All are severely underspecified in terms of providing the basic prerequisites for forming a holistic grammatical system. To some degree there is a phonology, but there is very little lexicon or syntax. Also all three types of Mandarin, at least in their working definitions, cannot be represented by a community of prototypical speakers. As soon as one encounters an actual spoken vernacular, a careful inspection will reveal important deviations from the hypothetical standard, as well as from other equivalent sister vernaculars grouped together under the same classificatory umbrella. Looking at these three types of Mandarin from a slightly different perspective, we could say that given their working definitions, there is no way to predict the full array of actual linguistic conditions to be encountered at any given geographical site or speech community. In order to provide that sort of information we must turn to a fourth type of Mandarin, one which we shall call Local Mandarin. Local Mandarin is simply the recognition that the neat checklist of linguistic diagnostics prepared by scholars to delineate Geographical Mandarin is insufficient to account for the overall grammatical system of any locality situated within its boundaries. Instead, every locale, because of its unique demographic history and linguistic composition, is to be treated as an independent speech community. For example, observations about Peking speech are relevant only to Peking. By definition these observations cannot be used to make any claims about the Mandarin spoken in Tianjin, Shanghai, Kunming or anywhere else. Likewise, observations about Mandarin spoken in Taipei or Singapore are relevant only to Taipei and Singapore. Ideally, studies of Local Mandarin ought to be grounded in the rigorous techniques of statistical analysis, providing both quantitative and qualitative information. At the very least, however, they must respect the principle outlined above that no speech community can be taken to be representative of another, without first possessing the objective data to prove that it can. One important distinction within Local Mandarin is the difference between those forms which have developed through continuous evolution (found primarily in the north), as against those forms which developed artificially through language planning within the past half century (found primarily in the south). In the former case, Mandarin has been the mother tongue for several centuries and has been influenced very little by Idealized Mandarin. In the latter case, Mandarin has only been introduced over the past few decades. This being the case, the linguistic role model for the first children learning this language was not their family elders, but rather teachers (who may or may not themselves have grown up speaking a non-Mandarin language) and the mass media, two important channels for the dissemination of Idealized Mandarin, I wish to label those varieties of Local Mandarin which developed through a centuries old process of continuous use [+native], and those varieties which have been spoken in communities only within the past few decades [-native]. This use of the term “native” does not mean to imply any degree of superiority or authenticity. After all, every variety of Local Mandarin is meant to be taken on its own terms, irrespective of any other variety. It merely serves to differentiate between endemic and introduced varieties of speech. The most important point that can be made on the basis of what has been outlined above is that any discussion of an entity called “Mandarin” must by necessity be very explicit in identifying the exact type of Mandarin being discussed. Is one talking about Idealized Mandarin or Local Mandarin? If it is indeed Local Mandarin, which of its myriad varieties is being addressed? One should not trivialize the basic distinctions among these four types of Mandarin. Idealized Mandarin is based upon ideas about the way language ought to be; Imperial Mandarin was a highly undernourished attempt to guide the scholar-official through the linguistic mysteries of the north; Geographical Mandarin is an artificial construct: while Local Mandarin is by nature very limited in its scope. Most problems arise because linguists confuse Idealized with Local Mandarin, and of ten mix together several varieties of Local Mandarin to boot. With an understanding gained from the discussion above, we know that pronouncements about Idealized Mandarin must necessarily be prescriptive, while pronouncements about Local Mandarin must necessarily be descriptive. An earlier version of this paper was presented at the twentieth International Conference on Sino-Tibetan Languages and Linguistics, 21-23 August 1987, Vancouver, B.C. Canada. Luo Changpei and Lyu Shuxiang (1956:7). shui4 ‘tax’, shu3 ‘heat’ wei4 ‘defend’ qie. The major problem with both systems, in addition to their presuppositions about their readers’ knowledge of written Chinese, is that they ignore synchronic and diachronic differences. Over the centuries speech in all regions of China has been undergoing phonological change, while each community has been changing at its own rate and in its own unique direction. In general, however, northern speech differs much more from the phonological standard underlying both duru and fanqie than does southern speech. For example, in most varieties of northern speech final oral stop consonants have been lost causing homophony among many groups of finals which were originally distinct. Such has not taken place within most southern varieties of speech. Also, the system of initial consonants differs greatly in number and type as one moves from one community to another. The result is that because most characters are read with different pronunciations by people from different parts of China, what is a perfect match between two characters in terms of initial or final in one variety of speech is often lost in another variety. Neither southern pronunciation nor a knowledge of the proper reading of poetry were ever of much help (at least within the past 800 years) in speaking like a northerner. Barnes, Dale. 1982. Nationalism and the Mandarin Movement: The first half-century, in Cooper, Robert L. (ed.) Language Spread. Bloomington: University of Indiana Press, 260-290. Beijing Daxue Zhongwenxi [Department of Chinese, Peking University]. 1964. Hanyu Fangyan Cihui. [A Vocabulary of Chinese Dialects]. Beijing: Wenzi Gaige Chubanshe [Script Reform Press]. Cheng, Robert. 1985. A comparison of Taiwanese, Taiwan Mandarin, and Peking Mandarin. Language 61:352-377. Hashimoto Mantaro. 1986. The altaicization of Northern Chinese, in McCoy, John and Timothy Light, (ed. ) Contributions to Sino-Tibetan Studies, Cornell Linguistic Contributions, V. Leiden: E.J. Brill, 76-97. Liu Zhenti. 1961. Guoyu Jiaoyu [Mandarin Education]. Taipei: Taiwansheng Zhengfu Jiaoyuting Guoyu Tuixing Weiyuanhui [Committee of the Taiwan Provincial Bureau of Education for the Promotion of Mandarin]. Luo Changpei and Lyu Shuxiang. 1956. Xiandai Hanyu guifan wenti [Problems in the regularization of modern Chinese], in Xiandai Hanyu Guifan Wenti Xueshu Huiyi Wenjian Huibian [Procedings of the Academic Conference of Modern Chinese]. Beijing: Kexue Chubanshe [Scientific Press], 4-22. Yuan Jiahua. 1960. Hanyu Fangyan Gaiyao [An Outline of the Chinese Dialects]. Beijing: Wenzi Gaige Chubanshe. Zhu Dexi. 1984. Hanyu fangyanlide liangzhong fanfu wenju [Two types of yes-or-no questions in Chinese]. Zhongguo Yuwen [Chinese Language] 1:10-20.